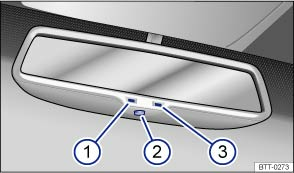 The driver must adjust the interior mirror so that the driver can see clearly the rear area through the rear window. Basic position: the lever on the lower part of the mirror is at the front towards the windscreen. Sensor for determining light incidence. 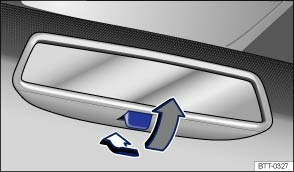 The automatic anti-dazzle function is switched on and off using the switch in the interior mirror . The indicator lamp ① will light up when the automatic anti-dazzle function is switched on. When the ignition is switched on, the sensor ③ will darken the interior mirror automatically according to the amount of light it detects. The automatic anti-dazzle function is deactivated when the reverse gear is engaged or if an interior or reading light is switched on. The illuminated display of an external navigation device can lead to functional impairment of the interior automatic anti-dazzle mirror and cause accidents or serious injuries. Impairments of the automatic anti-dazzle function may mean that the interior mirror cannot be used to exactly determine the distance to vehicles travelling behind or to other objects. If the light on the sensor is hindered or interrupted, e.g. by a sun blind, the automatic anti-dazzle interior mirror will not function or will not function correctly.